A mission to answer questions as old as the space age launched from Cape Canaveral this morning as two armored satellites were sent into hellish orbits that submerge the craft in Earth's punishing radiation belts. "We have been waiting for this mission for decades. 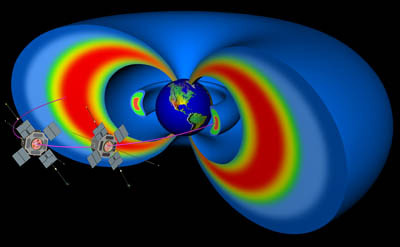 The Van Allen Belts were discovered in 1958 and since that time we know some things about the radiation belts but not enough. This mission is designed to really understand the whole solar interaction with the radiation belts and understand why they are excited (by the sun) and why sometimes they are not," said Richard Fitzgerald, the RBSP project manager. "This twin-satellite mission is supremely equipped to make the measurements that will help us understand what the processes are going on within the belts." Discovered by James Van Allen with America's first artificial satellite, Explorer 1, in 1958, the radiation belts are a pair of donut-shaped regions ringing the planet filled with trillions upon trillions of high-energy particles that are trapped by Earth's magnetic field. Seeking to understand how these invisible bands behave in quiescent times and respond to titanic space weather storms unleashed from the sun, puffing up and deflating seemingly without clear reasoning, NASA today dispatched two identical scouts with sophisticated instrument suites to study the belts like never before. 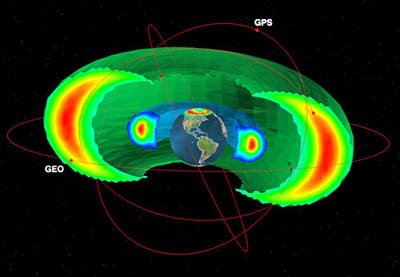 "Scientists will learn in unprecedented detail how the radiation belts are populated with charged particles, what causes them to change and how these processes affect the upper reaches of the atmosphere around Earth," said John Grunsfeld, associate administrator for the Science Mission Directorate at NASA Headquarters. "The information collected from these probes will benefit the public by allowing us to better protect our satellites and understand how space weather affects communications and technology on Earth." 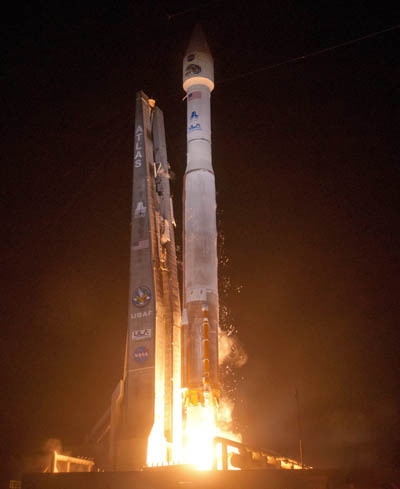 The $686 million Radiation Belt Storm Probes mission, spearheaded by the Johns Hopkins University Applied Physics Laboratory, rode a United Launch Alliance Atlas 5 rocket from Cape Canaveral, departing from Complex 41 at 4:05 a.m. EDT (0805 GMT). "The twin spacecraft will serve as the baseline for all radiation belt science for the next generation. This truly is a mission that would have thrilled my high school physics teacher," said Tim Dunn, the NASA launch director. The kerosene-fueled first stage burned for four minutes before separating to allow the cryogenic Centaur upper stage to ignite for a 9-minute initial burn to reach a preliminary parking orbit. The nose cone was jettisoned four-and-a-half minutes after launch to uncover the twin satellites stacked one atop the other. The rocket then settled into a coast mode across the equatorial Atlantic, Africa, the Indian Ocean and flew over the northern shores of Australia before restarting the RL10 upper stage engine 69 minutes into flight for a four-and-a-half-minute burn that accelerated RBSP to the intended highly elliptical, low inclination orbital perch. The upper satellite was deployed 79 minutes after liftoff, while flying south of Hawaii, into an orbit with a high point above 19,000 statute miles, a low point of 370 miles and inclination titled 10 degrees to the equator. The upper stage then employed its thrusters for 140 seconds to nudge the orbit's apogee 40 miles higher to release the the bottom RBSP craft 91 minutes after liftoff. 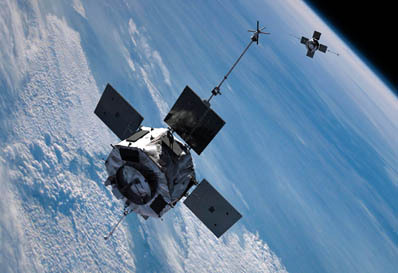 Those subtly different orbits, whose periods take 9 hours for one revolution, will allow the two satellites to collect measurements at ever-changing separation distances, sampling the radiation belts from varying perspectives in space and time. One satellite will lap the other every 75 days, as they operate as close as 100 miles and as great as 24,000 miles apart while cutting through the heart of both inner and outer radiation belts, said Nicola Fox, the RBSP deputy project scientist. "We talk about one spacecraft lapping the other. What makes that exciting is that both spacecraft are exactly the same -- all the same sets of measurements are on the two different spacecraft. So, for the first time, we'll have completely identical sets of instruments on both sides that we can compare between the two satellites. And actually say, 'Oh, this is happening here, and that's happening there.' Maybe they work together or maybe they're different things. But we've never had a pair of identical spacecraft in this region before," said Craig Kletzing, principal investigator of the Electric and Magnetic Field Instrument Suite and Integrated Science Instrument from the University of Iowa. Shortly after being cast free from the rocket, the craft unfolded their stowed solar panels for power generation and embarked on a 60-day commissioning period to activate and check out each of the instruments before the two-year science mission begins. "We are going after a long-standing set of mysteries in the radiation belts with instrumentation that will be fundamentally transformational and allow us to answer old questions and make new discoveries," said Harlan Spence, principal investigator of the Energetic Particle, Composition, and Thermal Plasma instrument suite from the University of New Hampshire. RBSP will measure particles, including the full spectrum of energies from cold, dense plasma to very high energy protons, plus characterize the electric and magnetic fields around the Earth. Scientists once believed the radiation belts were stable bands of radiation. But a joint Air Force-NASA satellite in 1991 revealed the belts were dynamic, and another craft has monitored the aggressively changing regions over the past two decades. Now, the sophistication of RBSP and the mission's focus on the behaviors of the radiation belts should re-write the decades-old text book on this harshest region of near-Earth space. "Until RBSP there has never been a comprehensive, coordinated investigation with two spacecraft simultaneously," said Spence said of the belts. 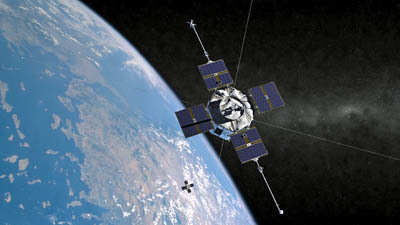 As an element of NASA's Living with a Star Program, RBSP will work in concert with the effort's Solar Dynamics Observatory launched in 2010 to watch as the sun emits massive impulses, those ejections impacting Earth and how the radiation belts morph and respond as a result of the storms. "We are launching in a period of high solar activity, so we are nearing solar max. We stand the best chance of seeing a lot of solar activity excite the radiation belts, and that's exactly what we want to see happen," said Fitzgerald. Such storms can upset satellites and disrupt communications and navigation signals, degrade the power-generating panels of orbiting craft and threaten astronauts with high doses of radiation. The inner belt, typically more stable of the two, extends from the top of the atmosphere out to an altitude of some 4,000 miles. The outer belt, which is more dynamic, extends from about 8,000 miles to more than 26,000 miles above Earth's surface. The belts' unusual responses to solar storms are perplexing to scientists because sometimes they swell up in greater size and energy, yet other times in similar types of storms they shrink and diminish in intensity, and even in other episodes they don't appear to react at all. If RBSP can unravel that mysterious behavior and allow space weather forecasters to become better skilled at predicting solar storms, satellite operators could take steps to brace orbiting assets against impending harm. What's more, developing better modeling of the region would allow satellite builders to design craft more suited to the conditions they will face. Financiers don't want to launch a craft under-shielded that can't live and work in harsh conditions, quickly getting crippled, nor do they want to expend the expense and engineering to construct an over-protected battleship. To survive two years looping through the belts, the RBSP spacecraft are hardened with an extra one-third-of-an-inch shielding to stop highly changed particles from penetrating their sensitive internal electronics boxes. "I'm a runner and as a runner there is a slogan you see at track events: My sport is your sport's punishment. Our mission is other missions' punishment. We are going to a place other missions try to avoid, and we need to live there for two years. It was one of our biggest technical challenges," Fitzgerald said. 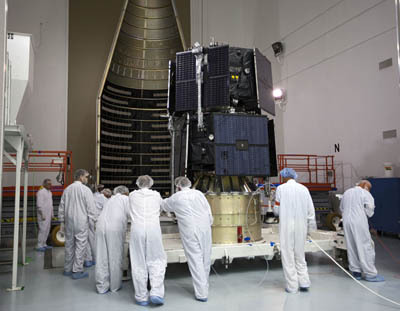 The upper spacecraft on the launch stack, known as Probe A, weighed 1,428 pounds at launch, while the lower satellite, called Probe B, had a mass of 1,470 pounds with the added structures to support and release its sister. They spin at five revolutions per minute throughout the mission, allowing their fixed instruments to continuously scan. "We have modern micro-electronic technologies now that would been the envy of the early Explorers. The ability to pack highly sophisticated and capable instruments into small volume and mass allows us to do things even now better than when we first proposed the mission," said Spence. Each are octagonal spacecraft made of aluminum and carry 124 pounds of hydrazine fuel for small adjustment maneuvers using eight 0.9 Newton Aerojet MR-103G thrusters. They generate 350 watts of power through the four deployed solar arrays, operate on a BAE RAD-750 radiation hardened computer processor with 16 MB of RAM and communicate via two broadbeam S-band antennas. The probes' main bodies are 5.9 feet across and 4.3 feet tall and stretch 26.6 feet wide once the solar arrays and magnetometer booms are deployed. Upcoming in the post-launch operations will be deployment of wire-like booms, no greater than coat hangers in thickness, for the Electric Field and Waves Suite instrument that stretch a football field in length from tip to tip, some 334 feet long. Kletzing says the mission to better understand the radiation belts has practical benefits to all. "The practical reason is: that's a part of space that we utilize. The outer radiation belts are where all our communication satellites exist, the various things that make sure that GPS works, as well as telephone communications," he said. "They can be affected by these particles, and, in fact, it has happened that those satellites have actually been knocked out by radiation. "So, understanding these effects and how they happen and, hopefully, get beyond to where we can do some level of prediction is a very important practical reason. "Additionally, the various manned missions that NASA has planned to go beyond the space station to places like the moon or Mars also require transiting through this region," he says. "So, understanding the right time to go -- when the particles are fewest so that you don't impact human health -- is a very important thing to understand." Still, there's the quest for knowledge that compelled scientists to start working on the RBSP concept in the late 1990s. "We want to know how the heck the darn thing works," he says. "We've learned from science over the years that you can't always predict that one thing you learn here will influence another field and allow whole breakthroughs to occur. So it's really both. The practical, direct reasons, but also if we understand the physics of the radiation belts, that helps us understand physics in other stellar systems and all sorts of other phenomena that are related."